I have to admit to having a soft spot for coffee table books, the sort of oversized tomb which can only comfortably be read on the flat. 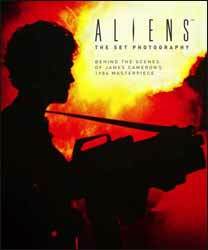 Aliens: The Set Photography: Behind the Scenes of James Cameron’s 1986 Masterpiece is an oversized book which takes a photographic look at the film. The book has been compiled by Simon Ward; you could not really say that it is written by him as the book is overall limited in text, as it mostly consists of descriptions for the various shots. It does have a new introduction by Carrie Henn, who did a good job playing Newt and some new quotes by Jenette Goldstien who played Vasquez. The book runs to one hundred and forty-four pages. Apart for the initial publicity pictures of the cast and crew, overall the format of the pictures generally follows how they would appear in the chronology of the film, with the ‘on set’ pictures working their way from Ripley’s awakening to the final battle. Together these take up over one hundred of the book's pages. From then on the photographs detail some elements of the Aliens, the effects, the Sulaco and its drop ship, the APC, weapons and the planet’s surface. In the first section few of the shots are from the final film print, you get some recognisable publicity shots, but mostly they are ‘behind the scene’ shots showing the making of the movie. Although this section has a cornucopia of shots, of all different sizes, full page, double page, picture within picture they all suffer from the same problem. For the most part the shots are grainy and soft, giving the impression that many of them were blown up from much smaller prints. Secondly, there is only so much pleasure that can be gained seeing pictures of shots, which you recognise from the film, being filmed. The second half of the book fairs a little better, the shots remain continually too soft, but at least you get some good looks at the details of the alien and the other special effects. The book is released to celebrate the thirtieth anniversary of the film’s release.